Dynamo Pro Wrestling is proud to announce its next two all-ages professional wrestling events. 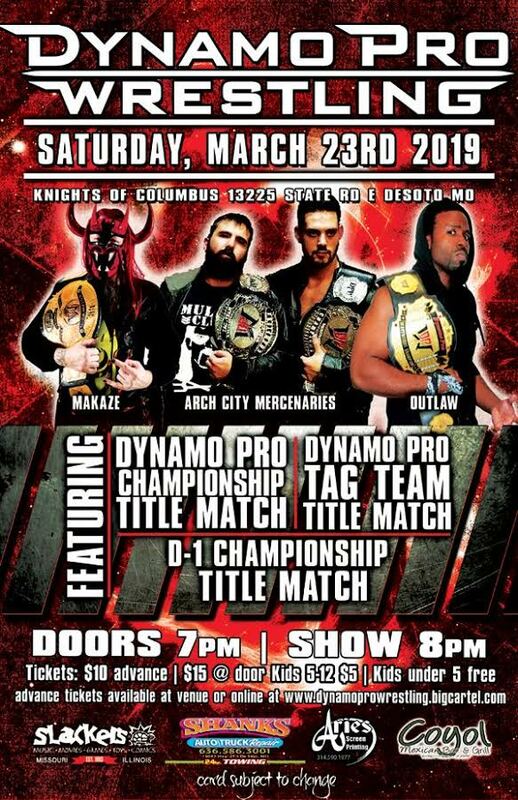 On Saturday, March 23rd, 2019, Dynamo Pro Wrestling will return to the DeSoto Knights of Columbus Hall, located at 13225 State Road E in DeSoto, Missouri. This event will be sponsored by Shanks Auto and Truck Repair, Coyol Mexican Bar and Grill, Slackers, and Aries Screen Printing. Doors open at 7:00 P.M. with a bell time of 8:00 P.M. Adult tickets are $10 in advance and $15 the day of the event. Tickets for children from five to twelve years old are $5. Tickets for children under five years old are free. Advanced tickets can be purchased at the DeSoto Knights of Columbus Hall or online at www.dynamoprowrestling.bigcartel.com. 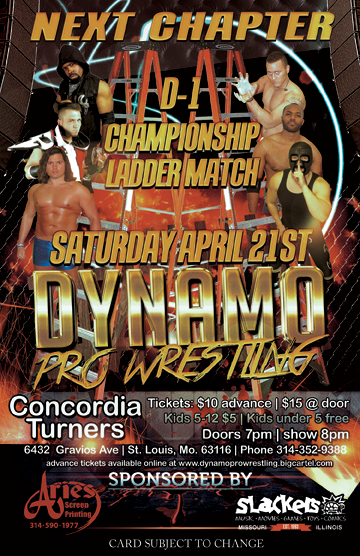 The Dynamo Pro Wrestling tag team, D-1, and heavyweight championships will be defended on March 23rd in DeSoto, Missouri. 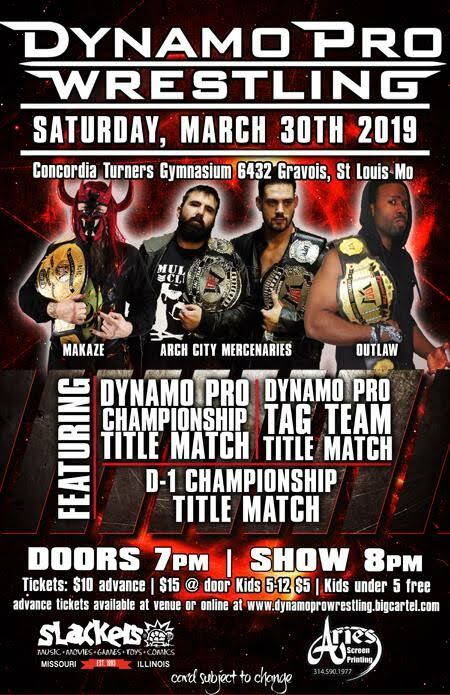 On Saturday, March 30th, Dynamo Pro Wrestling will return to the Concordia Turners Gymnasium, located at 6432 Gravois Avenue in St. Louis, Missouri. This event will be sponsored by Slackers and Aries Screen Printing. Doors open at 7:00 P.M. with a bell time of 8:00 P.M. Adult tickets are $10 in advance and $15 the day of the event. Tickets for children from five to twelve years old are $5. Tickets for children under five years old are free. Advanced tickets can be purchased online at www.dynamoprowrestling.bigcartel.com. 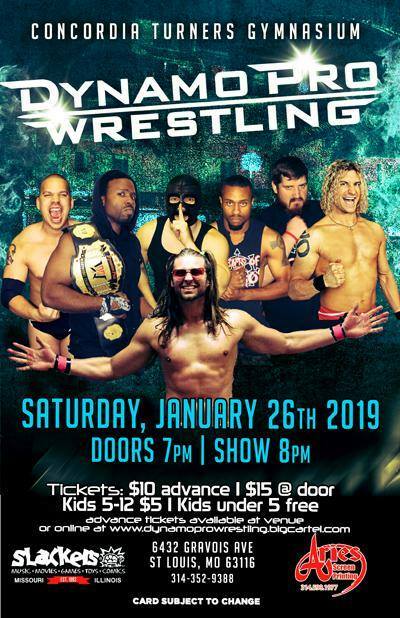 You will see such Dynamo Pro Wrestling favorites as Dynamo Pro Wrestling heavyweight champion “The Wind of Destruction” Makaze, D-1 champion Mike Outlaw, Dynamo Pro Wrestling tag team champions “The Arch City Mercenaries” Jimmi LaFleur and Tony Asteem, C.J. Shine,“The Valedictorian” Keon Option, Viktor von Stein, Xavier Shadowz, OuTtKaSt, Jackal, “Mr. Moustache” Ricky Rodriguez, “Mr. Excitement” Christopher Adams, and many more. 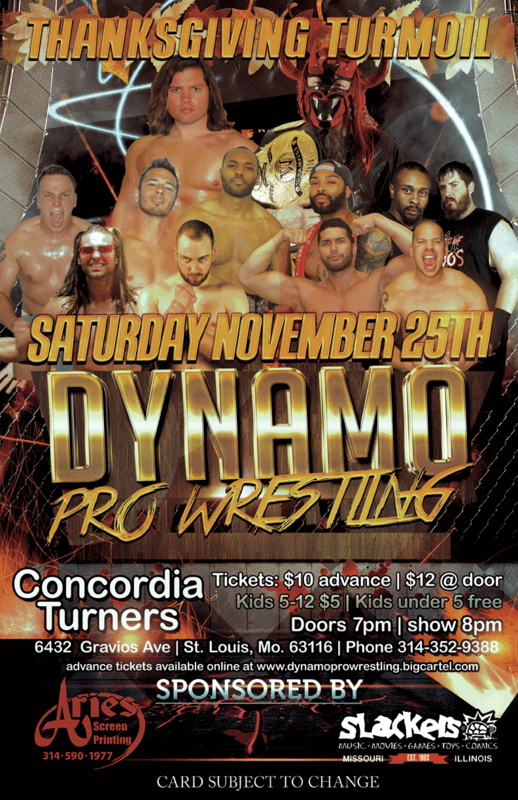 Experience the best in professional wrestling as Dynamo Pro Wrestling returns to the Concordia Turners Gymnasium! Since 2007, Dynamo Pro Wrestling has strived to bring professional wrestling fans of all ages with hard hitting, fast paced, edge of your seat professional wrestling action. For additional information on Dynamo Pro Wrestling, you can check out our website at www.dynamoprowrestling.com, follow us on Facebook at www.facebook.com/dynamopro, and on Twitter at www.twitter.com/DynamoPro. For DeSoto Knights of Columbus venue information, you can follow them on Facebook at www.facebook.com/knightsofcolumbusdesoto. For Concordia Turners Gymnasium venue information, you can check out their website at www.concordiaturners.org or follow them on Facebook at www.facebook.com/concordiaturners. Check out Nick’s recent interview with Luke Roberts from Dynamo Pro out of St. Louis, MO as he updates fans on the state of the promotion. 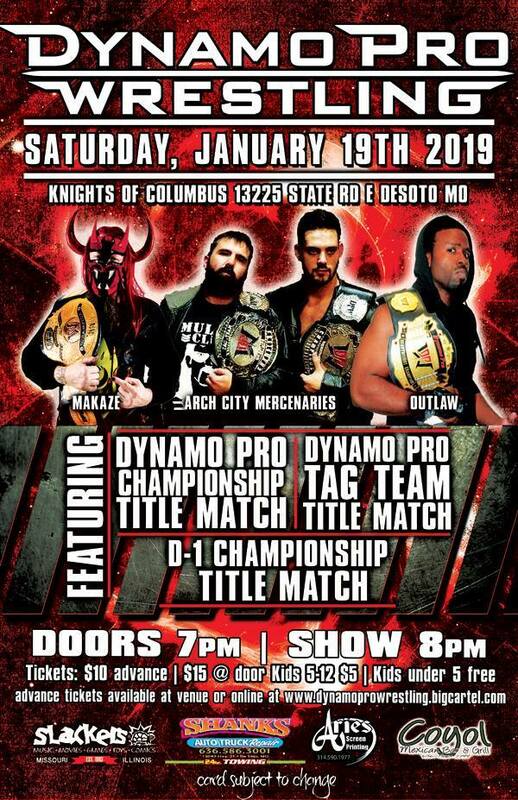 Their next shows will be on Saturday, Jan. 19 at the Knights Of Columbus Hall in DeSoto, MO with Dynamo Pro D1 Champion Mike Outlaw vs. Savanna Stone and on Saturday, Jan. 26. Dynamo Pro Wrestling is proud to announce an all ages, live, professional wrestling event on Saturday, April 21st, 2018. 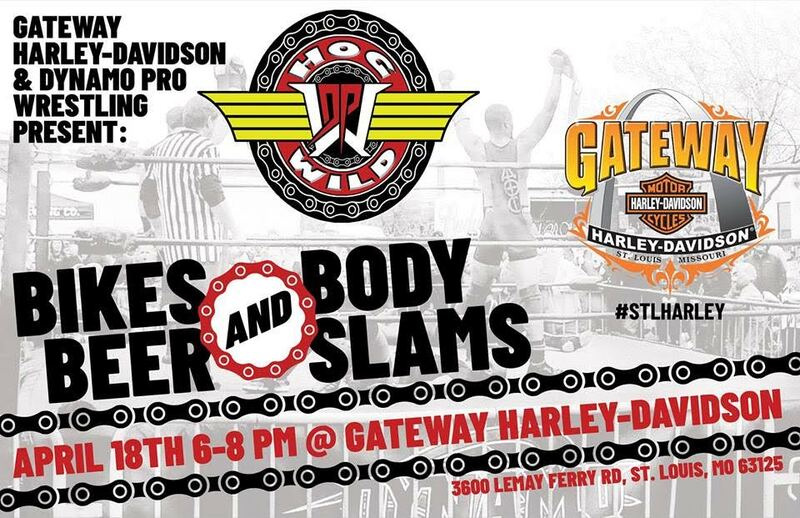 This professional wrestling event, sponsored by Slackers, Aries Screen Printing, and Computer Specialists, will be held at the Concordia Turners Gymnasium, located at 6432 Gravois Avenue in St. Louis, Missouri. Doors open at 7:00 P.M. with a bell time of 8:00 P.M. Adult tickets are $10 in advance and $15 the day of the event. Tickets for children from five to twelve years old are $5. Tickets for children under five years old are free. Advanced tickets can be purchased at dynamoprowrestling.bigcartel.com. This event will feature the highly anticipated six man scramble ladder match to crown the new Dynamo Pro Wrestling D-1 champion. This match will feature Mike Outlaw, “The Valedictorian” Keon Option, Brandon Aarons, The Snitch, Jayden Dominic Rose, and “The Warhorse” Jake Parnell. In this match-up, the first competitor to retrieve the championship belt will become the new Dynamo Pro Wrestling D-1 champion. You will also see such Dynamo Pro Wrestling wrestlers as Dynamo Pro Wrestling heavyweight champion “The Wind of Destruction” Makaze, Dynamo Pro Wrestling tag team champions “The Agents of Chaos”, “Lights Out” Adrian Surge, Jackal, Ricky Rodriguez, Savanna Stone, Tootie Lynn Ramsey, “The Gypsy Warrior” Orion Creed, “The Strangler” Roy Lewis, and many more. Please come out and experience the best in professional wrestling as Dynamo Pro Wrestling returns to the Concordia Turners Gymnasium. Courtesy of Dynamo Pro Wrestling. 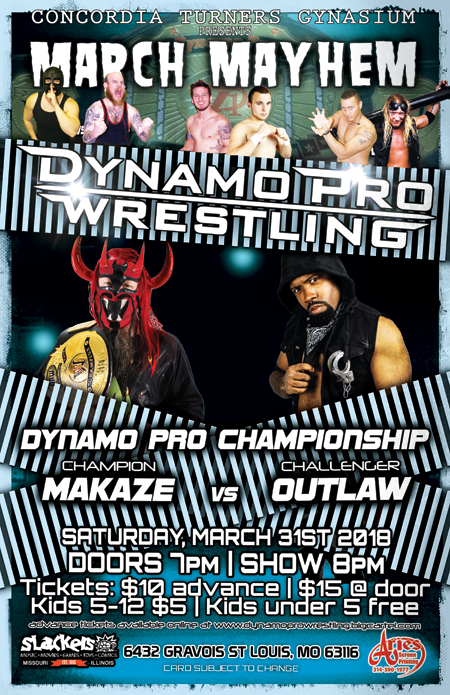 Check out Nick’s interview with Luke Roberts from Dynamo Pro Wrestling as he calls in to give fans an update on the promotion’s “March Mayhem” show in two weeks on Saturday, Mar. 31, runs down the card and what may happen come April. 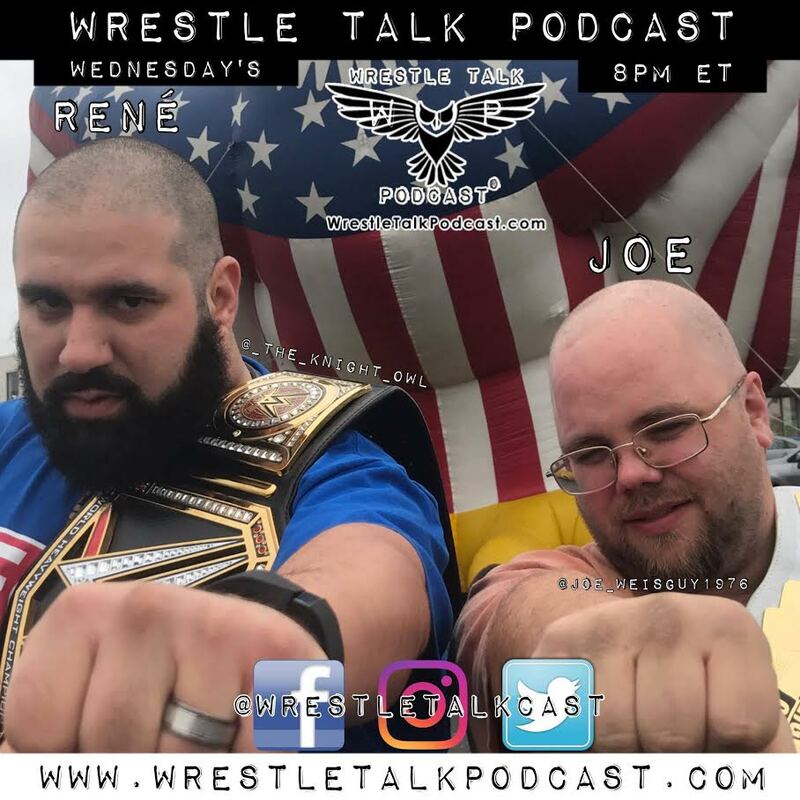 Check out the latest episode from our friends at The Wrestle Talk Podcast With Joe & Réne, which features Guests Brandon Aarons (Dynamo Pro Wrestling) and Kevin Lee Davidson “KLD” (GloryPro). As the first graduate of the Dynamo Pro Wrestling Dojo 10 years ago, Aarons has wrestled for many promotions throughout the United States. We will be discussing recent events in Dynamo Pro Wrestling, as well as the Dynamo Pro Wrestling event on Saturday, December 16th. At this event, Aarons teams with “Lights Out” Adrian Surge to take on “The Heartthrob” Jaden Roller and the Dynamo Pro Wrestling heavyweight champion “The Wind of Destruction” Makaze. A St. Louis, Missouri native, Davidson trained for his professional wrestling debut under the guidance of “Unbreakable” Michael Elgin. Since making his professional wrestling debut in 2014, Davidson has competed for promotions all across the United States, including the Mid-Missouri Wrestling Alliance, Dynamo Pro Wrestling, World League Wrestling, Southern Illinois Championship Wrestling, the National Wrasslin’ League, Glory Pro Wrestling, 3XWrestling, Dreamwave Wrestling, IWA Mid-South, Anarchy Championship Wrestling, New York Wrestling Connection, & AAW – Pro Wrestling Redefined. Davidson has also competed internationally in Canada and in Europe. We will be discussing recent events as well as the Glory Pro Wrestling “One Year Anniversary” event, to be held on Sunday, February 18th at the Meridian Ballroom on the campus of Southern Illinois University Edwardsville. Topics discussed include “Woken” Matt Hardy, Rich Swann gets locked up and Mia Khalifa’s comments. Dynamo Pro Wrestling is proud to announce an all ages, live, professional wrestling event on Saturday, November 25th, 2017. 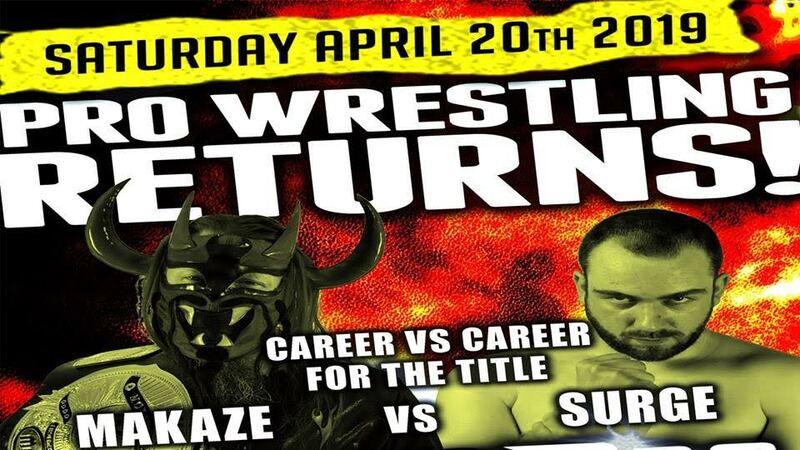 This professional wrestling event, sponsored by Slackers, Aries Screen Printing, and Computer Specialists, will be held at the Concordia Turners Gymnasium, located at 6432 Gravois Avenue in St. Louis, Missouri. Doors open at 7:00 P.M. with a bell time of 8:00 P.M. Adult tickets are $10 in advance and $12 the day of the event. Tickets for children from five to twelve years old are $5. Tickets for children under five years old are free. Advanced tickets can be purchased at dynamoprowrestling.bigcartel.com. Three big matches have already been signed for this event. The Dynamo Pro Wrestling tag team championships will be defending in a triple threat match as the former champions Keon Option and Justin D’Air and “High Level Enterprise” take on the new Dynamo Pro Wrestling tag team champions “The Agents of Chaos”. After the events of our last event, “Lights Out” Adrian Surge looks for revenge as he takes on “The Heartthrob” Jaden Roller. And, in the main event, the Dynamo Pro Wrestling heavyweight championship will be defended as “The Wind of Destruction” Makaze defends against former Dynamo Pro Wrestling heavyweight champion Brandon Aarons. You will also see such Dynamo Pro Wrestling wrestlers such as “The Filipino Warrior” Elvis Aliaga, C.J. Shine, Jackal, Frodo the Ghost, Aaron Dzinic, and many more. Please come out and experience the best in professional wrestling as Dynamo Pro Wrestling returns to the Concordia Turners Gymnasium. Check out our latest interview with Dynamo Pro Wrestling’s Luke Roberts, who chats with Nick about the St. Louis, MO-based promotion’s big upcoming show in association with Fighting For Autism, “Fall Chaos” and what’s possibly in store for 2018. 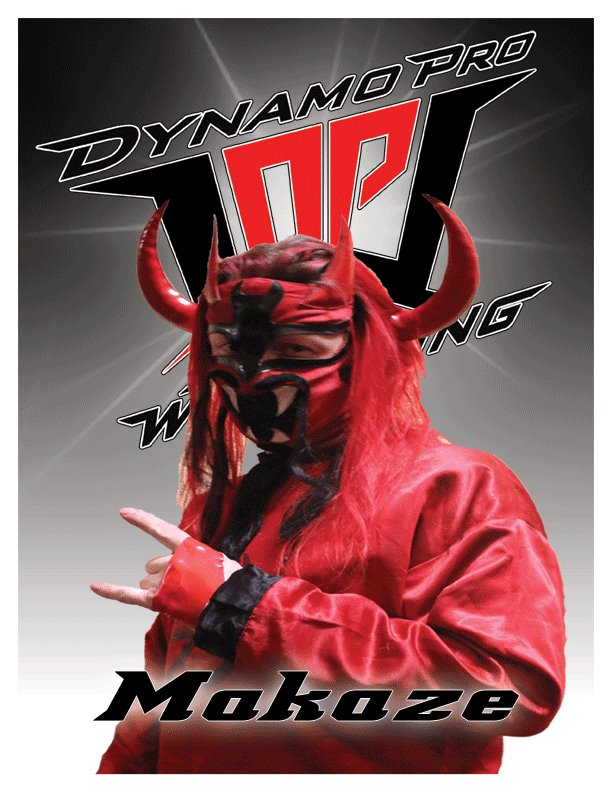 Check out Part II of our interview with Dynamo Pro Wrestling’s “Wind Of Destruction” Makaze, as the 18-year veteran discusses his scariest moment out of the ring, stories on the road, his moniker significance, influences, what he’d like to see happen in mainstream/local wrestling and more!